NOTE: As part of the ChineseBites media event, all food and beverages were free, but all opinions are based on my own personal experience. ChineseBites invited Naomi (Constant Cravings) and I along with our guests to sample some dishes from Firebird Cafe. 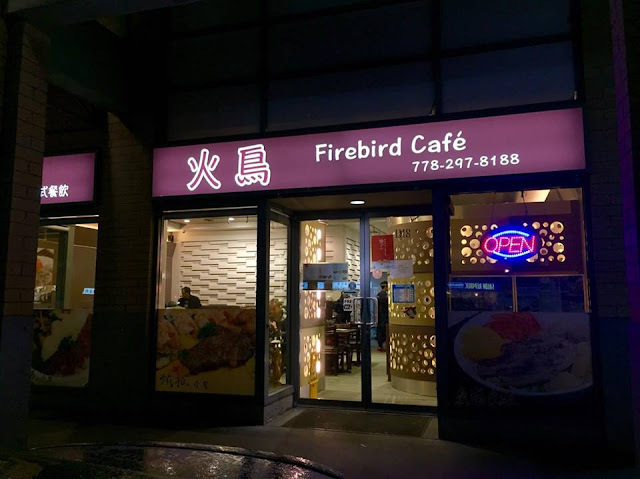 Located in Continental Plaza, it took over Tasty Rice Noodles, which was short-lived in the original Deer Garden spot. The interior looks exactly the same as Deer Garden and the menu is fairly similar. 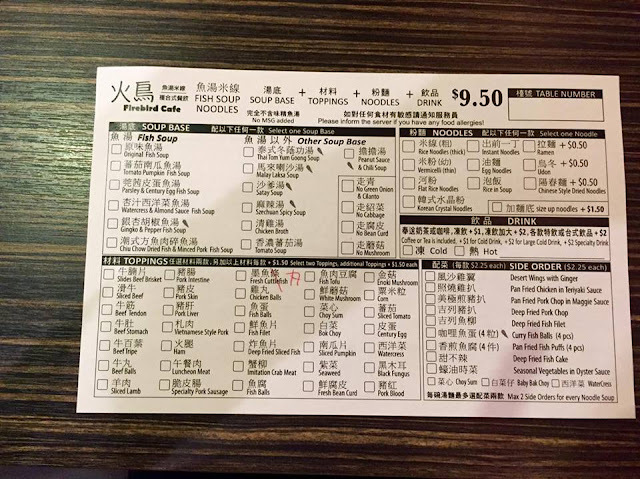 They are famous for their customized noodle soups and have pretty much the same order sheets as Deer Garden and the previous Tasty Rice Noodles. All of us were not really feeling a noodle soup that night, so we skipped this. 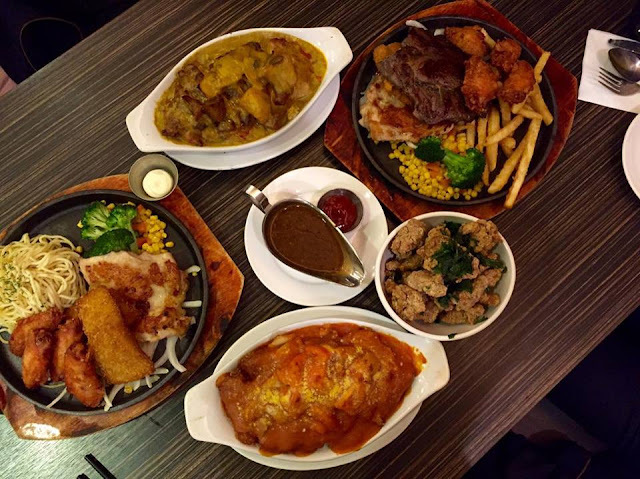 A new addition is their custom sizzling grills as well as their custom steamed rice. 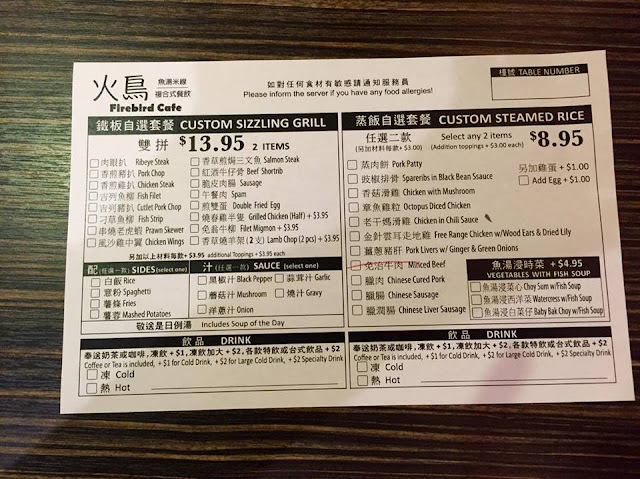 For $13.95, you can choose two items for your custom sizzling grill. 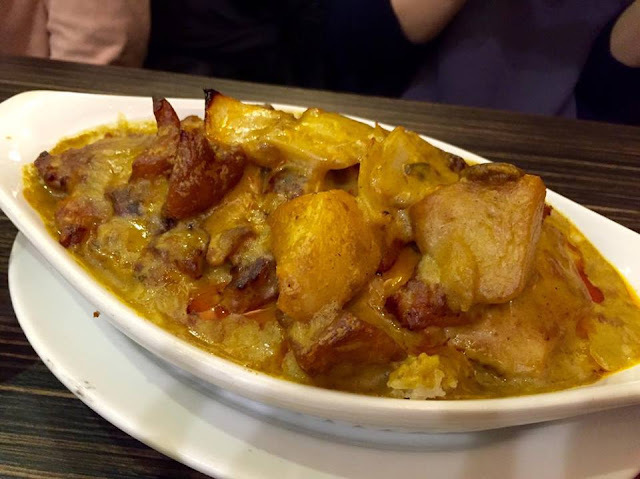 It comes with your a soup of the day, choice of a side (rice, spaghetti, fries, or mashed potatoes) and choice of a sauce (black pepper, mushroom, onion, garlic, and gravy). Coffee or tea is included with additional charges for cold or specialty drinks. Additional toppings are $3.95. We started off with an assortment of their specialty drinks. 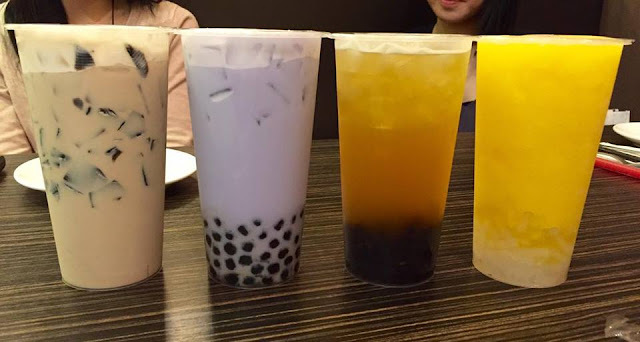 They were all pretty well made but don’t expect them to be as good as the ones from a specialty bubble tea shop. 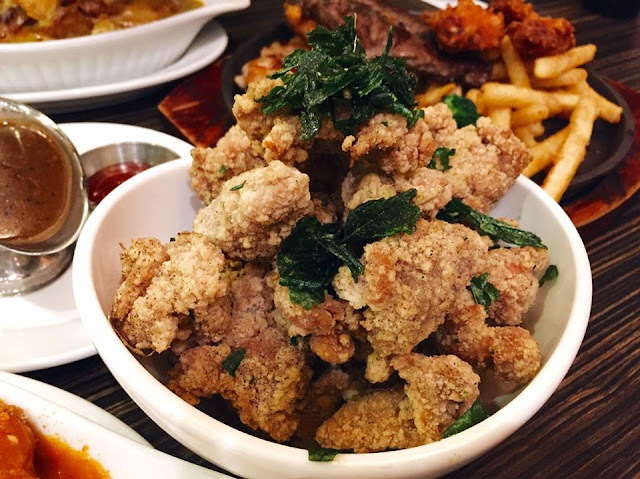 For appies, we had the Deep Fried Taiwanese Chicken Nuggets which were surprisingly really good at a HK style type of cafe. Topped with loads of basil and lightly battered, these were extremely flavourful with the chicken remaining moist inside. 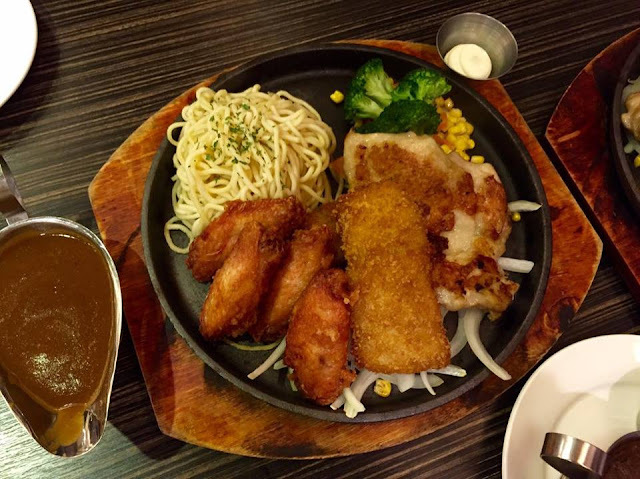 W got the Custom Sizzling Grill with Chicken Wings, Fish Fillet, Chicken Steak, Spaghetti and Mushroom Sauce. We were suprised how moist the grilled items remained. The grilled items were all very flavourful so the sauce was not really needed. I do find that for additional toppings, it can get a bit pricey. S got the Custom Sizzling Grill as well but with Chicken Wings, Ribeye Steak, Chicken Steak, Fries and Black Pepper Sauce. I really enjoyed the ribeye steak as it was very tender. Veggies were rather bland, but again, all the meats were very flavourful. For myself, I chose the Baked Pork Chop on Rice. This was a huge portion for under $10. The pork chop was moist and crispy, but I wish there was more sauce as I found myself left with lots of rice near the end. N got the Curry Boneless Chicken with Rice which I really enjoyed! It was a lot spicier than most HK style curries. 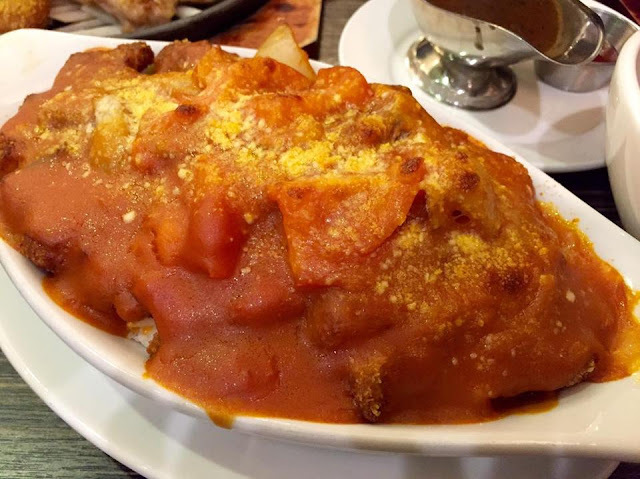 I liked the crispy potatoes and sauce! 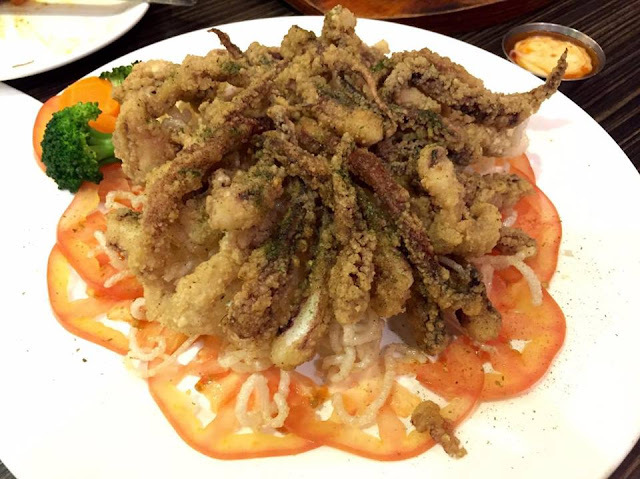 Lastly, we got the Deep Fried Squid Tentacles which took quite a while to arrive. We suspect that it was because they were taking the time to plate it so nicely… Anyways, they were slightly disappointing because the batter was slightly soggy. The squid itself was pretty good as it was chewy without being tough. They use a seaweed seasoning on top along with a sweet chili mayo, which is a little odd. This was just alright. 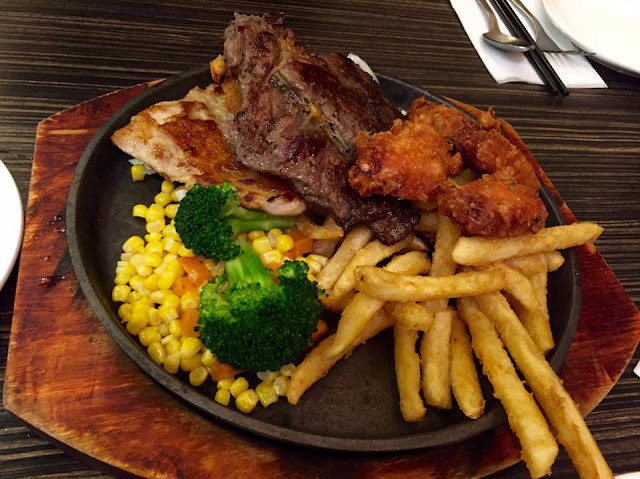 Overall, I quite enjoyed their baked dishes and custom sizzling grills. Portions are great for the price. Not a bad spot if you are looking for HK style cafe food.